It has finally happened, Drop It VR got Greenlit on Steam! Expect the game to be released very soon. Greenlight is a game developer’s platform on Steam. Where indie studios from around the world showcase their games and if the community showed interest in this game. Valve (the company behind Steam) will Greenlight the game and will contact the developers to start in the process of releasing the game on Steam. On the 28th of April, Drop It VR got Greenlit! 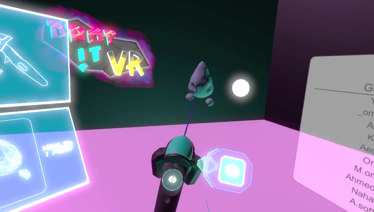 Firstly we would like to thank all of the people that supported Drop It VR ever since the beginning, alpha testers, beta testers, and everyone that gave us feedback during events to make this game the beauty that it is now. Last but not least, we would like to tell you that it’s not over yet. We still have a long road to go. We want Drop It VR to be accessible to everyone everywhere. We will be working to make it available for more VR platforms. We are also working on other modes and weapons to make the experience exciting and challenging with every time you play it. Find Drop It VR Greenlight page here. There is more to come, so stay tuned and expect to see the release date of Drop It VR on Steam soon. Thank You all!